Old houses sometimes have smells of their own. I live in an old house, and yes, it's clean (OK, OK, it's clean a good bit of the time), but sometimes you can clean all day and your efforts just need a little extra boost to keep things smelling fresh. We've used Febreze for years, most notably to cover up a dead mouse in the wall smell (yes, really), so I was eager to try out Febreze NOTICEables. 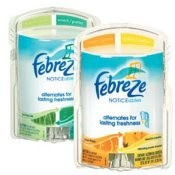 Anyway, Febreze NOTICEables are scented oil warmers that plug into any outlet and last for about 30 days. NOTICEables actually eliminate odors from the air. by alternating between two complementary scents all day. They come in quite a few scents pairs including special seasonal varieties (fall is out now), natural, fruity and fresh scents. The kids got hold of my samples first (don't they always?) and put it together and put in the bathroom upstairs. We have a 2 story house and within a few minutes, you could smell it all over the house, even on the low setting. It's quite nice and there's already an improvement in the "old house" smell in that area. Notie, I resisted commenting on a "bathroom smell" (you're welcome), but if you're wondering, it works for that, too. Want a chance to win some for yourself? To enter for a chance to win a $100 Visa gift card and a Febreze gift basket, leave me a comment below and tell me what is the most important thing you do to maintain a clean, fresh home - or you may leave a link to your post on your own blog in the comments below. The contest will begin at Sunday, September 27, 2009 and will end Tuesday, October 27, 2009. Make sure that the e-mail address you leave is correct. Don't forget to visit me at Busy Mom Blog! #1 thing I do to maintain a fresh smelling house: Open the windows and air the house out every day. Even when it's cold, rainy, etc. Making sure I exchange the stale indoor air for fresh outdoor air is important. We use disinfectant spray around the kitchen trash can and Febreze spray in the house. Just a little, because too much can be overpowering. The disinfectant spray keeps kitchen odors at bay (and the chemical smell doesn't stick around long) and the Febreze air effects helps with the "dog problem" (2 indoor-only dogs still smell like dogs, no matter how clean they are). I'm a huge fan of the Febreeze Noticeable I have in our dining room. My favorite way to control kitchen odor is to run half of a lemon with ice through the garbage disposal. It gets rid of any buildup on the blades and disinfects at the same time! I open the windows as much as possible and I use a Febreze Scent Story when I can't have them open. Do you know how hard it is to keep my house smelling fresh with the three Boxers we've adopted, a 13 year old who doesn't understand that you have to wash sports equipment and a husband who may be solely responsible for putting the whole in the ozone layer? - vacuum at least three times a week. That sums up most of it. To maintain a clean fresh home I use carpet freshener every time I vacuum, use Fresh Step kitty litter, THE best of the kitty litters, use Febreze on my curtains once a week, and open the windows every day. which helps a lot because we have two indoor dogs. I also like to use Fabreze spray on the couches and rugs. I try to open the windows at least once a week when it's not too cold out to get a good breeze through the house. I also make sure that every few weeks I hose out the indoor garbage cans; sometimes that leakage is the source of some pretty nasty smells. I am obsessed with making my home smell good! I am constantly burning scented candles and use febreze alot!! I also do regular cleaning of course and use bleach to sanitize! I spray everything with Pine-sol. Not because I adore the smell of Pine-sol, but it definitely makes the house smell like it was just cleaned from top to bottom. By my old Polish grandmother. Who was so fanatic about her clean house she would scrub (SCRUB with scrub brush and bucket) her front stoop every morning. She is probably scowling down at me from heaven right now. But my intentions are good! Most importantly, we try and always keep the bathroom clean b/c that's just a bit gross if it's not. We spray various scents. Don’t touch the dust. You can’t see it until there’s a fingerprint in it. Kidding. Kind of. I Windex the bathroom mirrors and Pledge the coffee table. If people smell Windex and Pledge they assume you clean all the time. Suckers. I keep my home fresh in several ways since I have dogs. I use carpet freshener, mop the tile floors daily, spray furniture with Febreeze fabric spray, burn scented candles, spray aerosols regularly. My goal is to not smell doggies even though I love them. I use deodorizing spray on the diaper pail to help freshen the baby’s nursery. We make sure to vacuum the high-traffic areas often and air the rooms out. I vacuum everyday and my house always feels cleaner after I do. We have a new rule with our big dog. When someone lets him outside they have to wipe down the walls with a disinfectant wipe (like lysol wipes) and sweep the floor in his room. It really has helped keep the smell and hair situations under control. Love my Febreeze too, we have a NOTICEable in the dogs room, the bathroom, the living room right at the front door, and in the twins bedroom.... they help so much. I want to try the Autumn scents! We constantly need to keep up with our floor. Our puppy is shedding constantly these days, so there's always a swiffer flying around. I love it when my house smells fresh and clean - consequently I love Febreeze especially their allergen reducer as many in my family struggle with allergies. I can attest that it truly does work and I am a big fan! I try to do a little bit each day so that it never gets bad enough to smell. I did just recently have to buy a new trashcan though because no matter what I did, cleaned, scrubbed, sprayed it all over with febreeze or lysol, it just STUNK. I like having plug-ins, candles, and diffusers around. Things like that to keep the house smelling fresh. To keep our home smelling fresh, we take the trash out right away and keep the dog off the furniture and on her own little beds with washable covers throughout the house. I use a new box of baking soda in the frige and freezer each month so it smells clean with all the left overs we try to keep. The most important thing I do to maintain a clean fresh home is to make sure the air is cirular no matter what. There are so many others I do to make our house is fresh and clean. Air refreshers are always one part plus never leave dirty dishes overnight, pack trash daily, vacuum daily and mop/dust regularly. I dry clean my rugs and bleach towels to sanitize regularly as well, these really help! The most important thing is to open the windows up as much as possible whenever possible to let the fresh air in. THe next thing is to Febreze the sofa, rugs, chairs etc. to keep them fresh smelling. One of the ways I maintain a fresh smelling home is by staying on top of the laundry. Lots of dirty laundry can really stink up a room. We have a dog so I need to sweep the floors several times a week, especially the kitchen. I also like to use sprays to neutralize the odors and I burn scented candles as well! I just found your site and it looks great! That first picture made me laugh. And I love Febreze! My roommates like to leave things lying around and it drives me bonkers. There always seems to be some smell lingering . . . I've tried vinegar and just keeping things clean where I can, but it's a battle. I live where it is warm a lot of the year so I open my windows whenever possible. I love having the fresh air inside. Having 7 indoor cats means having to keep the litter boxes clean. I also use a high quality litter and keep plug in's in the litter box room. Thats how I keep the house fresh smelling. The best way to maintain a clean fresh house is clean it and then change the locks so that the teenagers have to stay outside. I make sure bathrooms are cleaned with bleach, laundry is done and the garbage cans are empty and clean. Febreeze couches, beds and carpets. Keep the toilets clean!! Especially with a man and a small boy in the house. Icckkk. And my floors have to be clean....my house doesn't feel clean unless my wood floors are spotless. I keep the dog clean and spray behind him with the Pet Odor Eliminator by Febreze. I pick up a little every day so clutter doesn't pile up! I wish I could pretend that I have a clean fresh house. The best I can do right now is to keep the kitchen sink empty. I clean the house top to bottom once a week, so between cleanings I keep the kitchen counters wiped down and the floor swept. Somehow if the kitchen looks good the whole house looks good. I clean, vacuum and febreeze regularily!! I like to sprinkle plain baking soda before vacuuming. It gets rid of odors without bothering everyone's allergies -- like some of the scented vacuum powders can. I would say the most important thing I do is to open up my sliding glass door and windows to get fresh air into the house. I also like to light candles. Try to do a quick dusting and vacuum every day. Spray Clorox bathroom cleaner in each toilet (don't even flush) will help freshen the bathroom up! Having quadruplets that are still in diapers (ugggh!) -- It is a MUST that the dirty diapers go outside IMMEDIATELY!!! lol! The most important thing I do to maintain a clean fresh home is to pay my housekeeper! I use this too give my whole house a wonderful smell. So fresh and clean. Best of all' my Husband sprays his clothes before he leaves the house and he smells so good. most important thing for me is opening the windows, even is just for a few minutes every day. We open the windows every day, and I have scented diffusers in nearly ever room to keep our space smelling fresh and clean! 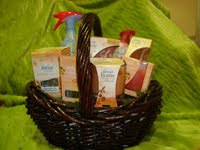 I also try to use "green" products to avoid harsh-smelling odors when we clean. i think cleanliness is an objective thing when it comes to the house. i think a clean sink and a clear living room floor is good enough for family. real company may require a vacuum. better be important company though! When the weather gets cooler I open all of the windows to air out the house, I vacuum three times a week and use fragrant candles and sprays. Baking soda in the kitty litter! Cleaning - not so much. I AM a candle fanatic, however! The issue there is that my husband is worried I will one day burn down the house by forgetting how many candles I lit and where. I love the idea of NOTICEables as I'm pretty sure they won't burn down the house. I open the windows to let fresh air circulate. I keep our boy's bathroom window open as long as I can throughout the year. I use Method wipes in the bathroom area, and use Febreze on the couch where our Old English Sheepdog hangs out! I don't really have much time to clean but once a week I go all out and make everything sparkle and smell good with my Mr. Clean with Febreeze. I really love to have nice scents throughout my house, because I think it very relaxing and has a lot to do with our moods,thanks to my febreeze. Years ago ,the boys would get off the bus ,walk into the house and get that fresh clean scent! I heard them talking about it years later and they loved that scent,big surprise to me,I didn't think they noticed!A clean home is also a healthy home because of keeping the germs away and its my way of showing them I love them. I love all the scents Febreeze has out and even burning a candle makes me happy. I clean with bleach ,use Febreeze and I feel good about my home! The most important thing I do to maintain a clean fresh home is to keep my hubby happy :) he does all the cleaning. lol! With two dogs and two kids my everyday battle to keep the house clean involves a lot of sweeping and wiping things down. If the weather allows windows are opened to get fresh air in. I do keep a bottle of febreeze to spray the dog bed before company comes over, lol. One of the things I do is open windows. Which is a bit, er, cold in fall/winter. I just noticed that there is an Autum/pumpkin scent. I'm all over that. Going to the store today to get some! I like to open the windows and let the house air out, and I also like to light candles. I try to make sure that I wash our dog's bedding every other week with a bit of vinegar added to the load. I wash the sheets and bedding every week. I also vacuum and mop often. With two big dogs and an active family the floors need to be clean. I use a hepa pet hair specific vacuum cleaner combined with febreeze spray to deal with pet odor, it doesn't help with the litter smell but everything else in my house smells great! Trying to keep a house clean with three boys AND a husband can be hard so I try to take out the trash daily, keep the floor swept and the dirty, stinky dishes clean! Not being the most inspired housekeeper, I have the outlet air fresheners in every room of the house. Then when the house is getting too unbearable, I invite friends over so I have to clean. I vacuum the couch with a handheld Dyson every other day. Helps keep the cat hair away! I clean on a regular basis. By clean I mean more than just a pickup. I deep clean. I also keep the trash emptied. With a baby and toddler in the house it's imperative that the trash get taken out daily. I also refuse to allow laundry to build up. I do, on average 2 loads every day. I also keep plug ins in the higher outlets so the boys can't reach and/or I burn nice light smelling candles. I use citrus scented cleaners, they R stronger, and the scent lasts longer. I also use the Airwick you add the can in, that hangs on the wall that squirts freshener every 30 min., that really helps alot. Picking cleaners that smell great and using them often. The most important thing I do is take the kitchen garbage out every night, because that is the smelliest thing in my house. I have to clean my cats' litter box regularly or my house smells like a crazy cat lady house! Take out the trash because trash cans will get stinky fast! I love to open windows and screen doors if it is nice and warm outside and let in the fresh air. Changing the bedding weekly, sometimes more. With 4 boys 4 and under, we have a lot of accidents. My very favorite way to keep my house smelling fresh is to open the windows and let the breeze in! I also love to use Febreeze on all the soft furnishings. Vacuum often. Febreze the furniture. Wash dirty laundry as soon as there is a load. I keep a clean kitchen. It is the center of our house and if it isn't clean, the rest of the house soon follows so I make sure the counters and sink and table are always clean.